Those of a certain age will remember the old classroom film projector and the dated-for-decades films that used to flicker through them. Experimental filmmaker Jay Rosenblatt certainly does. His latest work consists entirely of such found footage. Like Jonas Mekas (a comparison that would surely flatter the filmmaker), Rosenblatt is obviously fascinated by the promise of castoff cans of film, frequently assembling their retro images into cinematic essays, like The Darkness of Day, the title film of a mini-retrospective program of Rosenblatt’s recent work that begins a weeklong run at MoMA tomorrow. Consisting of two substantial twenty-some minute meditations on mortality and three comparatively minor shorts, the Darkness program starts with the blackly comic Afraid So, a briefly sardonic answer to the question “how bad can things get,” marrying Rosenblatt’s vintage imagery to Garrison Keillor’s recitation of Jeanne Marie Beaumont’s poem of the same name. Indeed, the unspoken refrain “afraid so” seems all too apt for Rosenblatt, considering the personal tragedies that inspired the longer, richer films of Darkness. Though Rosenblatt was only nine years old when his younger brother died, the ever-present grief and guilt he and his parents suffer to this day is a tangible presence in Phantom Limb. At first, Rosenblatt’s constructivist technique feels at odds with the confessional tenor of Limb’s first vaguely Kübler-Ross-echoing section, yet it becomes clear this is how Rosenblatt processes his pain. Disconcertingly, he strips his family emotionally bare with silent, brutally honest inter-titles, interspersed with ironic imagery culled from film archives. Though not quite as moving (or as challenging) as Limb, The Darkness of Day rather unflinchingly examines suicide with found footage that often looks too disturbing for the staid era during which it was filmed. Drawing on the journals of a friend who killed himself, Rosenblatt revisits famous suicides past, like that of the Japanese student who started a national craze when she hurled herself into the Mount Mihara volcano in 1933. Yet, where Limb offered a synthesis of grief, obscure and elusive as it might be, Darkness is only a cautionary lamentation that makes no pretenses of consolation. 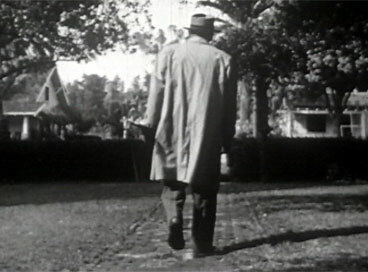 As the closing titles reveal, Rosenblatt’s family was also touched by suicide during the production of Darkness. Along with Limb, it is one of the more grimly powerful works one will see programmed under the rubric of experimental film anytime soon. Frankly, the other two shorts films are rather flat in comparison, especially I Just Wanted to be Somebody, which essentially gloats at Anita Bryant’s divorce and professional setbacks following her famous foray into the gay rights debate. However, Limb and Darkness are undeniably the guts of the program and they are worth seeing—provided viewers are not predisposed to depression. The Darkness program opens at MoMA on the (lucky) 13th, with Rosenblatt in attendance for the Wednesday and Friday night screenings.